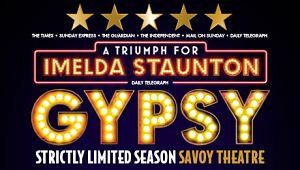 And more good new is that Baz Bamingboye reports in the UK Daily Mail this morning that Broadway could be next saying: "We are actively pursuing and trying to work out the right way to go to New York with Imelda in Gypsy,' said Michael Harrison, who produced the show with David Ian. The Jonathan Kent production recouped its costs and made a profit for investors which (as we know) doesn't happen with every musical production." He added that Stephen Sondheim was sitting behind him at the Savoy last Saturday and said it was 'beyond doubt' that Staunton's Rose was one of the best he has seen."